What Is behind Francis' Rehabilitation of Judas? Why are Bishops & priests soft on Christ’s teachings? Who's to Blame for the Pellegrini Scandal at the Vatican? No, Holy Father, the Crusades Were Not Misunderstandings! Changes in the form of absolution? 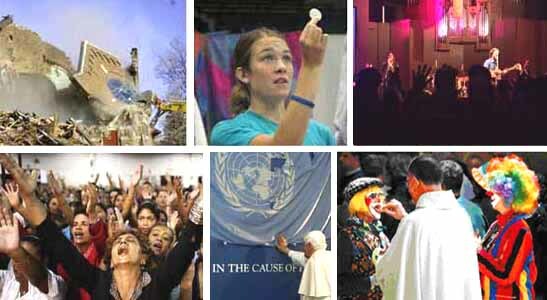 The New Church Has No "Aura"
An eyewitness report by John Vennari about its "fusion Catholicism"
Vatican Calls Church Sit-Ins a "Positive Sign"
Can this Story Be Right? Gary Morella on the article "Pope Bows to Liberty, Fraternity and Equality"
John Vennari analyzes the sermon of a charismatic preaching at a papal retreat. Are we being prepared for a policy of papal retirement? Was John XXIII's incorrupt body a miracle? Vatican Council III or Jerusalem II? What Is the Spirit behind the Charismatic Movement? A. S. Guimarães to Cardinal Avery Dulles: Do you deny your progressivist past? Why ask forgiveness for the Crusades, a noble episode in Catholic history? Are we dealing with a new notion of infallibility? Is the Vatican approving the notion of a future Jewish messiah? If a Pope teaches a grave error, should Catholics obey? Guimarães asks the Canon Law Society of America if it really supports this attack? Why didn't Vatican II condemn Communism?